Song of the South 1956 Original TItle Lobby Card Walt Disney Very Fine. 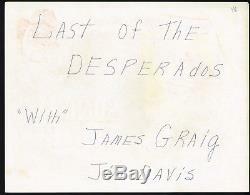 There is writing on the verso. 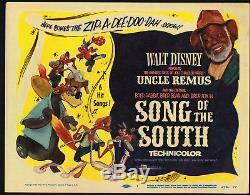 The item "Song of the South 1956 Original TItle Lobby Card Walt Disney Very Fine" is in sale since Wednesday, July 18, 2018. This item is in the category "Entertainment Memorabilia\Movie Memorabilia\Lobby Cards\Originals-United States\1950-59". The seller is "bmp5000" and is located in Waxhaw, North Carolina. This item can be shipped to United States, Canada, United Kingdom, Denmark, Romania, Slovakia, Bulgaria, Czech republic, Finland, Hungary, Latvia, Lithuania, Malta, Estonia, Australia, Greece, Portugal, Cyprus, Slovenia, Japan, China, Sweden, South Korea, Indonesia, Taiwan, South africa, Thailand, Belgium, France, Hong Kong, Ireland, Netherlands, Poland, Spain, Italy, Germany, Austria, Israel, Mexico, New Zealand, Philippines, Singapore, Switzerland, Norway, Saudi arabia, United arab emirates, Qatar, Kuwait, Bahrain, Croatia, Malaysia, Brazil, Chile, Colombia, Costa rica, Panama, Trinidad and tobago, Guatemala, Honduras, Jamaica.